I didn't watch Descendent of the Sun, but I do know that the Laneige Two Tone Lip Bar was popularized by this Korean drama. Previously I have reviewed the Witch's Pouch Selfie Like Shot Dual Lipstick and decided to do a comparison with the Laneige one. Among all the two tones lipstick, the Two Tone Lip Bar has the most colour options. There are 14 different pairs for you to choose. I picked up the Juicy Pop because the colour combination is really special - bright yellow and crimson pink. This is another special lip product. It comes in a form of powder, and when you glide it over, magically it turns into lip stick that doesn't feel like a lipstick. It is ridiculously hard to explain how this product works, basically it is just a lipstain that is in the form of powder. Interested to know more? Wait for my review soon. My previous experience with lip tattoo wasn't that good. It was OK, but didn't meet my expectation on the convenience part. Also from Rire, I will be trying the eyebrow tattoo. I believe it is much better than the lip tattoo because the applicator comes in a form of brush. It will be easier to manage. Let's see how it goes. I'm so obsessed with macarons these days that I couldn't resist dropping these two darlings into my cart. I really don't have much hope on the products in terms of its efficacy, however they're so pretty to look at. Oh well, they're just some implusive buying products. Read about my previous Althea haul <<here>>. So much damage has been done for these two rounds of shopping. I do hope the products are useful and effective. Do watch out for my separate reviews where I will talk about the products in detailed after trying them a couple of times. 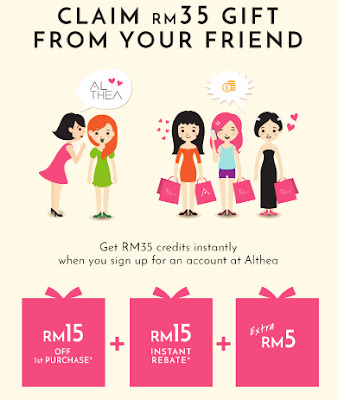 At the mean time, if you would like to shop at Althea, do use my referral link <<here>> and you will get RM35 credit instantly once you sign up. Disclaimer: I don't earn any commission from your purchase. Instead, I will earn 10 points for each registered users. These points allow me to trade for products I want from Althea. Hye Jerine, this is Mira from Althea. We would like to thank you for joining in our Birthday Celebration. We hope you had fun!